I grew up in Detroit, which is to say I did not grow up in the suburbs. Not in Northville, nor Birmingham. And, much as I probably could have learned to like it, I also did not grow up in Grosse Pointe, a place where life was so good they made four more: Grosse Pointe Woods, Grosse Pointe Park, Grosse Pointe Farms and the village of Grosse Pointe Shores. But, this isn't just about basketball. As the planetary capital of entertainment, LA has played a large role in shaping what the world thinks about Detroit, what with all the movies and rappers pushing "The 313" area code as some sort of badge of honor, as though any affiliation with it provides a kind of instant "street cred," as if just saying "I grew up in Detroit" means that you survived life south of Eight Mile. What could be more badass than that? Whatever it is, or whatever that means, the Detroit I grew up in was Murder Capital of the World and Y.B.I. was no frozen-yogurt parlor. Even as a kid who'd never known anyplace but Detroit, I knew I wanted out of it as soon as I was old enough to commit my street address to memory. I continue to be amazed by how many people boast of their Detroit roots. Based upon my personal observations alone, I'd say there's enough to constitute a retroactive recount of the city's Census figures from all those post riot years, during which the population was supposedly shrinking. But, then again, maybe some of these folks have their borderlines mixed up. Madonna may be one of them, although I don't profess to know who started spreading her Detroit myth. The Material Girl, it seems, was a suburban girl, not that there's anything wrong with that, but she doesn't appear to miss it. Her "Sticky & Sweet Tour" won't even stop near Detroit, let alone in it. Toronto and Chicago are as close as she'll get. Eminem has made much of his affiliation with Motown but, near as I can tell, he grew up in the suburb of Warren. Rough as Warren may or may not be, the dictionary defines "warren" as a network of rabbit burrows, so you can hardly blame a rapper for choosing not to emphasize that to a worldwide audience on his liner notes. Regardless, Detroit does not claim Warren. It's a suburb as the dictionary defines it, though probably not in the affluent sense society so often expects. But the Detroit Pistons � Surely the Pistons are from Detroit. Indeed, and so are the Lakers. And just like the Lakers, the Pistons don't play in Detroit anymore either. The Lakers started as The Detroit Gems, an NBL team in the late 1940s. It left Detroit in 1947 to become the Minneapolis Lakers, then, of course, left Minneapolis in 1960 to become the LA Lakers. The Detroit Pistons left Detroit in the late '70s, but kept Detroit in their name (Psst, Los Angeles Angels of Anaheim take note). The Pistons play in Auburn Hills, which I couldn't find on a map without first consulting an index, and I grew up in ... like I said. It matters because it's a lie, because, like so many others, the Pistons fled to the suburbs, but still claim to be a part of city. It matters because that kind of behavior is part of what's ailed Detroit since the '70s. The suburbs are where all the money in Detroit went, leaving behind empty houses and stores, and a lot of people who couldn't afford to get out. Would a Piston NBA championship in 2008 benefit the city? I can't imagine how with all the games being played out in the burbs. Despite all the talk and play off the city's name, I still see more boarded-up builidings in Detroit than in any other major US city. Its sidewalks are cracked and overgrown with knee-high weeds, vacant buildings mark the landscape like giant tombstones, and urban prairies now sit where blocks of homes once stood. Jurisdictional boundaries may be faint pastel colors on a map, but in Detroit you often don't need a map to see them. All you need do is look at the condition of the structures and the roads. 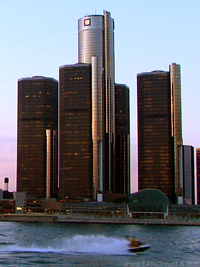 I can't say I love Detroit, but I feel a certain sense of responsibility to defend it. My earliest memories are of it and the sports teams that bear its name. I remember the red transistor radio that used to dangle from the handlebars of my banana-seat bicycle, always tuned to WJR's broadcasts of Tiger games with Ernie Harwell (it was that or the Watergate Hearings). The only TV I ever knew until I went to college was a black-and-white box no bigger than my current microwave oven with a telescoping antenna on top, good enough to get WDIV, The Detroit Tiger Network, with George Kell and Al Kaline. The first professional baseball game I attended was at Tiger Stadium. It was also the day I realized the beauty of grass. I got my first hockey stick at a Red Wings game, on Stick Night, at Detroit Olympia Stadium. I drank Vernors and Faygo Pop, both Detroit originals. I ate at coney island restaurants and stood sentry behind the bushes out front every Devil's Night. My first and second cars were used American cars, though I can't say for sure either of them was made in Detroit. Fewer and fewer pistons have been coming out of there the past couple decades. But can I root for these so-called Detroit Pistons? I'll take the Lakers, a team that, like me, is a Detroiter by birth, but proud to call Los Angeles home. Unlike The Pistons, The Lakers are part of the city they represent. The Lakers play in LA, whatever LA is supposed to be. We're so unlike any other city, so spread out and apart, more than 100 different municipalities stitched together to make the Greater LA Area, which in terms of jurisdictional boundaries makes LA more of a state of mind than New York purports to be. And yet, The Lakers play in LA. -- Portions of this post first appeared in response to questions from fellow writer and blogger John Ettorre at Working With Words, in Cleveland. Click to e-mail TJ Sullivan.